Protests include street party outside Bank of England dubbed "Financial Fools Day"
LONDON, England (CNN) -- Social networking Web sites are set to play a crucial role in protests ahead of next week's G-20 meeting of world leaders in London as demonstration organizers and police use Twitter and Facebook as key sources of real-time information and intelligence. 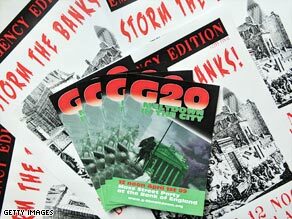 Flyers and posters for next week's G20 Meltdown protests urge particiipants to "Storm the banks!" Metropolitan Police leaders have warned that the city faces an "unprecedented" wave of protest in the run-up to Thursday's summit talks on the state of the global economy and are set to deploy huge numbers of officers to maintain public order. Thousands of protesters are expected to march through the streets this Saturday in a rally organized by trade unions and left wing groups. But it is plans by anti-capitalist and environmental protesters to converge on the Bank of England next Wednesday -- April 1 -- for a "mass street party" dubbed "Financial Fools Day" that have prompted most concern. The protest, organized by an umbrella group called "G-20 Meltdown," will feature four separate "carnival parades," each led by giant "Horseman of the Apocalypse" puppets. A flyer for the event, carries the slogan "Storm the Banks!" and features images of French revolutionaries storming the Bastille in 1789 and a mannequin of a banker hanging from a noose. Marina Pepper, one of the organizers of G-20 Meltdown, said that Twitter, the blogging tool that allows short updates to be filed, published and read via cellphones, would be used to coordinate the protests -- and warn participants of possible trouble. "In terms of mobilizing people and shifting them around, Twitter will be used next week," Pepper told CNN. "We can also keep people empowered, because information is power." But Commander Simon O'Brien, one of the senior officers involved in policing security around the G-20, said social networking sites would also be a "key area of our intelligence gathering." "That's where we are picking up a lot of our intelligence about numbers and what certain groups are aiming to achieve," O'Brien said. "G-20 is attracting a significant amount of interest from protest groups. There is an almost unprecedented level of activity going on." Pepper rejected accusations that protest organizers were encouraging violence, arguing that the event belonged to an historical tradition of "street theater and the spectacle of protest" -- and said those taking part had been urged to bring pillows for a mass pillow fight rather than a riot. But she warned that dissatisfaction with the government and the state of the economy was likely to provoke a minority to violent protest. "It's a tinderbox out there but it's not a tinderbox because of the G-20 Meltdown protests. It's a tinderbox because the government has f****d the economy basically.... I would appeal for everyone to come out in their Sunday best and drink tea and eat cake." Pepper said social networking sites had "revolutionized" how protest groups organized themselves and had become a key means of disseminating information, as well as creating networks of like-minded people that could be re-utilized for future events such as climate change talks in Copenhagen later this year. The G-20 Meltdown Facebook group had been adding 100 members a day, she said. "In terms of getting the knowledge out there, the fact that you can back it up with movies, links and photographs makes it a very powerful tool. It's a form of collective consciousness." Pepper also criticized British Home Office proposals revealed this week that could see details of users' social networking activities logged in a government database. "It's very Big Brother," she said. "The idea that the information that you put out can then be used out of context at a later date is incredibly scary. It's not that I mind the government reading my Facebook page, it's just that I don't trust them with the information because I think they lack a sense of humor more than anything. People have to have freedom of expression."